The Outdoor Sealed System OD SS2 26kW Oil boiler is a non-condensing, floorstanding unit from Mistral. As the boiler is designed to be installed outside your home it has a weather resistant casing that is zinc phosphated providing maximum protection from corrosion. It’s also finished in a highly durable green texture finish that helps it to blend in with its outdoor surroundings. By installing the boiler outside you both save space in your home and remove the need to have an oil line inside reducing the risk of mess in your home. This highly reliable boiler has a high efficiency rating of 93% making the unit A rated. It has an output rating of 26kW making it perfectly suited for the small homes with not such a high demand for heating or hot water e.g. those with one bathroom. 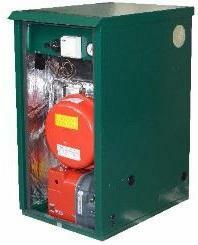 It’s also available as a condensing and in a range of other outputs from a 15kW to a 41kW. Key features include a circulating pump, 12 litre expansion vessel, safety valve, pressure gauge and an automatic air vent. You have the option of a 2 or 4 door port and the boiler’s design enables front servicing access, a multi directional flue outlet, a pre punched pipe access point and is able to be used in tandem operations. All of these features allow this boiler to be a highly reliable and efficient unit. It is pre-fitted with a frost protection stat to protect the unit in the cold winter months when you need it most.